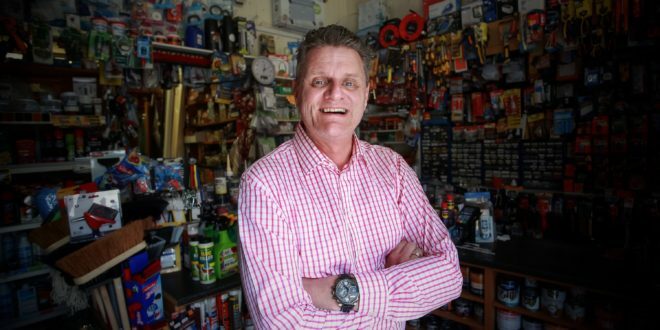 Hardware store owner Steve Robson was once bitterly opposed to people-friendly improvements planned for the street outside his shop. He helped to raise a petition against the scheme, attended meetings to express his opposition and was in the local newspaper claiming the plans to remove parking places would be "devastating for businesses". He is now a poster-child for "bikenomics", the theory that making towns and cities more cycle-friendly is good for the local and national economies. He stars in a new Sustrans video promoting the charity’s Bike Life report, which is published today and which reveals 75 percent of Brits are in favour of installing protected cycleways throughout the country. In 2014, Newcastle City Council revealed plans to spend £350,000 of a £10.6m Cycle City Ambition grant from the national government on reducing car access to Acorn Road in Jesmond, an affluent Newcastle suburb. The plans – which included wider pavements for pedestrians and a contraflow for cyclists – were met with bitter local opposition. Robson, owner of Acorn Hardware, was one of the leaders of the opposition. “We do not mind change to bring the area into the 21st century, but we don’t want to lose any of our parking spaces," he told a local newspaper at the time. “If that happened it would be devastating for businesses and put a big strain on shops. If people can’t park it will put people off – simple as that." Along with another business owner on the street he created a high-profile campaign to oppose the council’s plans. The pair placed unmissable full-length posters in a vacant corner shop urging passers-by to “Save our parking – say no to council plans”. The opposition led to a watering down of the council’s original plans, but a number of improvements were later carried out including making the street one-way for cars, but allowing cyclists two-way access. A cycle-specific traffic light was also installed and cycle parking stands added. "Two years ago the council decided to change the road from a two-way to a one-way system with the loss of up to 20 car parking spaces. As an independent retailer I wasn’t too happy with this. "However, since the changes have been made Acorn Road has become more vibrant with the increase in pedestrians and cyclists. Now with more bike racks we get more cyclists coming into the store." In an earlier video, produced by Newcastle City Council, Robson said the improvements had "made it a lot of difference to the business – [the street] is more people-friendly now." Robson’s swing to cycling isn’t unusual – many retailers often oppose the installation of cycling infrastructure close to their stores believing it will lead to a decrease in takings. The opposite usually occurs. Many studies from around the world have shown that designing streets for people and not cars leads to an increase in retail takings. A 2016 economic benefits of cycling study done for the Department for Transport found that "cycle parking allows 5 times more retail spend than the same space for car parking" and that "cycle friendly neighbourhoods can have greater retail spend." And a 2014 report done for the DfT’s Cycle City Ambition Fund showed that investing in cycling brings huge economic, social and health benefits, with some cycling schemes having a benefit-to-cost ratio (BCR) of up to 35 to 1. The Cycle City Ambition schemes have average BCRs of 5.5:1 – the DfT said this means that "for every £1 of public money spent, the funded schemes provide £5.50 worth of social benefit." The DfT’s "Value for Money" guidance says a project will generally be regarded as "medium" if the BCR is between 1.5 and 2; and "high" if it is above 2. In transport terms, 35 to 1 is off the scale.